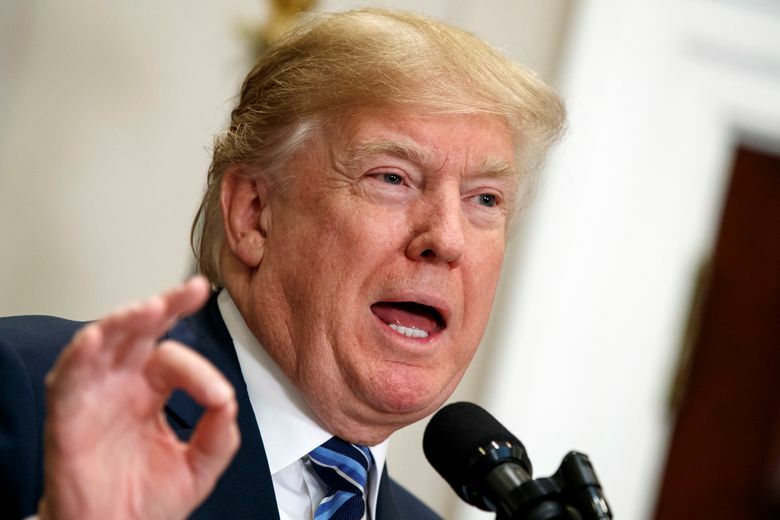 WASHINGTON (AP) — President Donald Trump is trumpeting the rolling back of federal rules and regulations in his administration’s first year even as critics say he has tried to dismantle important protections for the environment, consumers and others, and that his claims are overblown. “For many decades, an ever-growing maze of regulations, rules, restrictions has cost our country trillions and trillions of dollars, millions of jobs, countless American factories, and devastated many industries,” Trump said Thursday, flanked by giant stacks of paper he said represented regulations that have stifled economic growth. “But all that has changed the day I took the oath of office and it’s changed rapidly, Trump said. Trump signed an executive order days after taking office in January that directed agencies to identify two regulations to cut for every new one they intended to issue. Agencies also had to offset any new regulatory costs with cuts by eliminating existing rules. Trump said his government had well surpassed its goal, eliminating 22 regulations for every new rule it enacted. “We blew our target out of the water,” Trump said, crediting the moves for boosting economic growth and sparking stock market gains. Deregulation has been a priority during a year in which Trump’s legislative agenda has faced headwinds in Congress, including the Republican failure to repeal and replace former President Obama’s health care law. 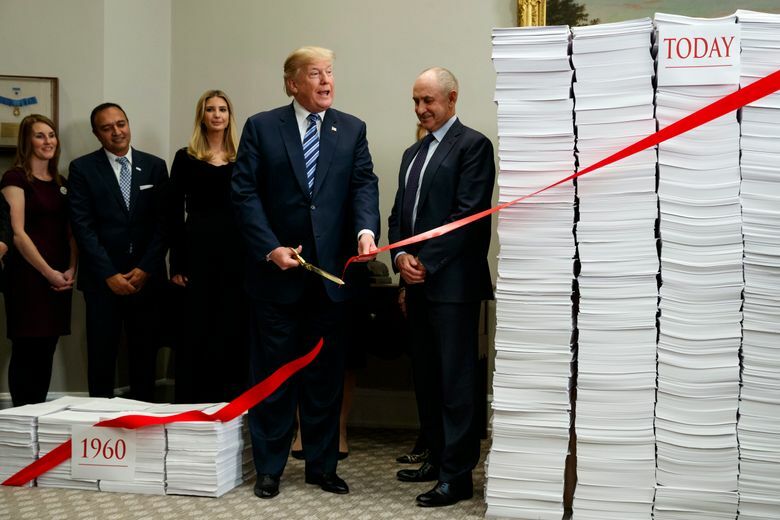 To demonstrate his efforts, Trump used large golden scissors to cut a red ribbon draped over stacks of paper representing regulations on the books in 1960 versus today. “We must liberate our economy from years of federal overreach and intrusion so that we can compete and win on the world stage,” he said. But Stuart Shapiro, a Rutgers University professor who worked at the Office of Information and Regulatory Affairs during the Clinton and Bush presidencies, cast cold water on the claims. “There’s some reality there and a lot of bluster,” he said. Deregulatory actions must go through the same review process as imposing new rules, and just because they are listed on the agenda doesn’t mean they will become effective, Shapiro said. The announcement came the same day as the White House released the “Unified Agenda of Regulatory and Deregulatory Actions,” an assessment of the executive branch’s rule-making efforts. Follow Colvin and Miller on Twitter at https://twitter.com/colvinj and https://twitter.com/ZekeJMiller.